Kevin proposed to me. At the Detroit Institute of Arts. On Groundhog Day. I said yes and have since gotten quite used to having such a stunning ring on my hand. I'm head over heels in love with him. We picked a date. August 12 in Colorado. It'll be in my parents' backyard. I spent spring break in New York City. 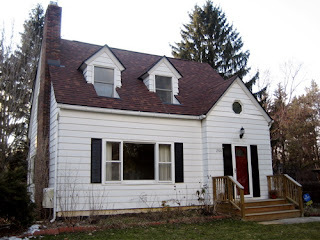 We fell in love with a house in Ann Arbor and put an offer on it. It was accepted. Today I found out that the foundation is probably in really horrible shape (~$60,000-worth of work) and unless a miracle happens, the homeowners probably won't fix it for us. I cried at first when I found out, because after our offer got accepted, I started to picture us in that house. I had an idea of where I would put plants in the kitchen, of how our bedroom would look, of who would come visit us and be our guests. I wanted the yard, the wood-burning fireplace, the old-house character. I'm wondering if I have the courage to pray for a miracle. I'm wondering if this is something God wants for us at all. It's hard to imagine what it would be like in five years to decide to move to Kenya or anywhere else God might call us, with this house on our hands and in our hearts. It was always a step of faith to move forward with this, but now I'm finding that I just want to be passive. I want to sit back and let whatever happens happen, saying "Thy will be done" instead of engaging with God in real prayer from my heart. Asking. But I don't even know what I want anymore. Honestly, I feel afraid. There seemed to be a path opening up for us on which to walk. Now that it's no longer so visible, I'm forgetting what I'm about. It's amazing how a simple thing like a house could confuse me so much. I am finding, though, after trying to hash this out, that the only thing for me to do at this point is keep moving, keep remaining active. Tonight I'm going to the dorms to spend time with Anna, who really wants to understand why so much bad stuff has happened to her, despite her faith in God. Later I'm going to watch Lost with Kevin, and it'll be one of the first times in awhile when we can do something truly carefree together. Somewhere in there I'll find out about whether or not this house will be ours, and either way, I'll be ok, which is really really really good to know.